We provide Logistics Services that we provide to the organizations that deal international or multi-national export and import. We can arrange Sea Freight Forwarding for national as well as international destinations. 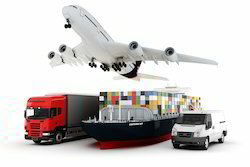 We are one of the leading licensed International Logistics in Mumbai. With established procedures, effective technology and solid relationships with Customs authorities help ensure our clients goods are delivered when expected. We manage all documentation and can initiate the clearance process before goods are in transit to expedite clearance.